Location: Between W corner of Roath Basin and sloping sea wall. Built probably c. 1870. On Ordnance Survey First Edition, (surveyed 1876-78). Predecessor to Customs and Excise Office in Bute Street. The building was moved and re-aligned circa 1993. Neo-Tudor. Two storeys of thinly coursed local rubble with pale sandstone dressings. Distinctive crenellated parapet, quoins and cornice band. 4-centred arched horned 12-pane sash windows with freestone surrounds; left hand window blocked up. Tall central porch with similar parapet and blind heraldic panels (coats of arms missing); narrower windows and boarded door entrance to left hand side. 1-window end elevations with similar sashes. Rear is rendered with blocked doorway towards R of each floor. 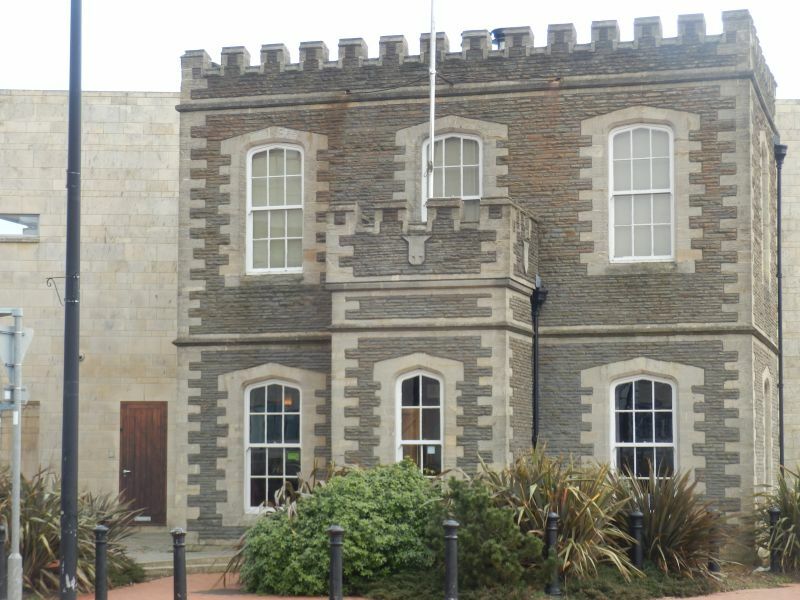 Listed for historical interest to Cardiff Docks and for its striking castellated style. On NW side and parallel to lock approximately 20 metres from inner lock gate. On SE side and parallel to lock, approx. 40 metres from outer lock gate.